Most experts from the learning industry would agree that videos are a strong and impactful tool for learning. Videos can engage the learners and make lasting impressions on their mind. This is particularly useful in the area of corporate training, as the learners need to recall and apply the learning in their area of work. The eBook Learning@Videos traces the beginning of video-based learning and highlights its many benefits in the modern perspective of continual workplace training. Video-based learning is effective because of several reasons. Fighting the frequent boredom which occurs often among learners, it successfully increases learner engagement. It communicates information in a simple and direct manner. By communicating information without beating around the bush and coming straight to the point, it promotes knowledge retention. Accommodating multiple learning styles, it also improves acquisition of abstract and complex concepts. With advancement in technology, videos have raised the ranks in terms of visual appeal and effectiveness. We have created and implemented video-based learning for a number of organizations with varying needs and different learner profiles. 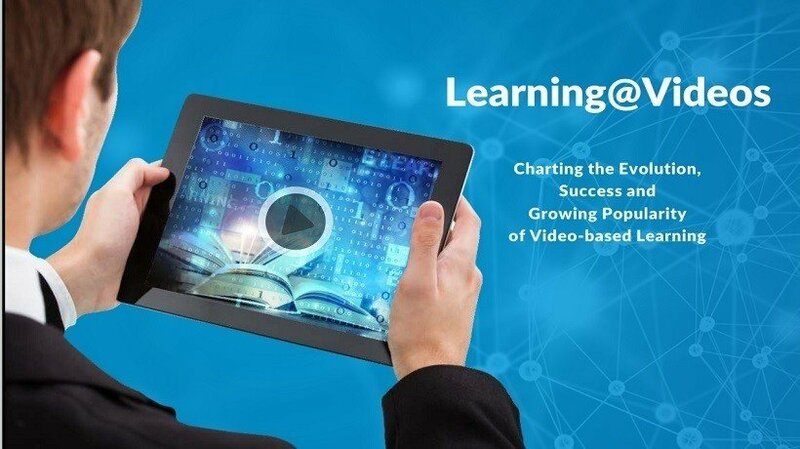 Our experiences and knowledge is reflected in the free eBook Learning@Videos: Charting The Evolution, Success, And Growing Popularity Of Video-Based Learning. Read on this free eBook to understand the evolution and future of Video-based learning. We begin with tracing the evolution of learning videos – How videos were first used to enable learning. This helps us gauge how far we have come in terms of technical advancement as well as refinement of content. Next, we explore the tenets of video-based learning – What does it mean? What are its benefits? How effective is it as a learning tool? Does it comply with different learning styles? Then, we move on to the actuals – designing and delivering video-based learning. We identify the right type of videos to suit different learning needs, with examples to illustrate our point. Including tips for creating as well as implementing video-based learning strategy, this section is full of practical knowledge that comes handy when starting off with video-based learning. Finally, the proof of the pudding – From our experiences in the industry, we have included several case studies that illustrate the ways to create effective learning videos for varying learner needs. This section highlights the variety and flexibility of video-based learning. From the cauldrons of our experiences, we have extracted learning to create an appropriate background for video-based learning and re-enforce it with information that will help you create as well as adopt an effective video-based learning strategy. The evolution of learning videos is traced here through a visually impactful infographic. Top Benefits Of Video-Based Learning. Why Does Video-Based Learning Stick With Learners? How Do Learning Styles Link To Video-Based Learning? Design And Deliver Video-Based Learning For Success. When To Use Video-Based Learning? Types Of Videos: How To Choose The Right Strategy? How To Design A Successful Video-Based Learning Experience? Implementing A successful Video-Based Learning intervention. G-Cube’s Experience In Delivering Video-Based Learning. This section shares 3 informative case studies of G-Cube which illustrate how video-based learning can be implemented for learning success. Learning@Videos: Charting The Evolution, Success, And Growing Popularity Of Video-Based Learning is informative and full of practical knowledge that will help you understand the relevance of video-based learning for modern corporate audiences through a sound backing of history, definitions and benefits, a practical guide-map as well as illustrated examples. Download the eBook to get started with video-based learning!